If you have ever lost or forgot your password to access the WordPress dashboard, it can be very frustrating. Luckily WordPress provides quite a few options to reset or change your WordPress password. If you already know your previous WordPress admin password, and would just like to change it, you can easily update the password from the WordPress dashboard. You should get an email with the subject [WordPress Site] Password Reset. The body of this email will contain a link below the text To reset your password, visit the following address, go ahead and click on that link. You can directly change your WordPress password in the database using phpMyAdmin if you forgot it. You should only use this method if you're comfortable with working with databases in this fashion. It's also recommended that you always backup your database in cPanel prior to making any database modifications directly. 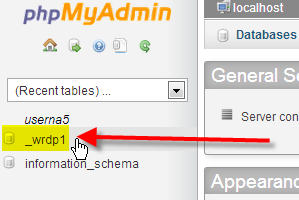 Under the Databases section, click on phpMyAdmin. Click on the name of your WordPress database. Next click on the wp_users table. 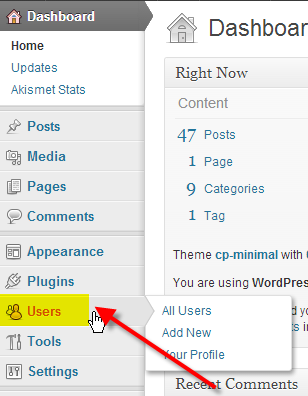 Click on Edit beside your WordPress admin user. In the user_pass field, paste your password by pressing Ctrl - V.
From the drop-down, select MD5. You should now see a success message from phpMyAdmin saying the database record was updated. If you don't have access to your WordPress database, you can also reset you password with FTP. Login to your website via FTP and navigate to your theme's functions.php file and download it to your local computer. In this example, we're setting the password to password, and we're updating it for the user admin, if your admin user has a different username you'll want to be sure to use that. You'll also want to make sure that you're using a secure WordPress password. Upload this modified functions.php file back to your /themes folder on the server. Login to your WordPress dashboard using the new temporary password you just set. Now that you've successfully reset your password, remove the wp_set_password line from your local functions.php file, and re-upload it. This way WordPress doesn't reset the password every single time the admin dashboard is accessed going forward. If other solutions did not work, then you may wish to try using the Emergency Password Reset Script. It is not a plugin but rather a PHP script. Using this script requires you know the admin username. The script updates the admin password and sends an email to the admin's email address. If you do not get the email sent, the password is still changed. The script is to be placed at the root of your WordPress installation. Removing the script when finished is extremely important for security reasons. Copy the emergency script from Emergency Password Script and place it into a file called emergency.php in the root of your WordPress installation. Enter in the WordPress admin username (typically admin) and the new password, then click Update options. Delete the emergency.php file from the server when you are done. Leaving this script on your account is a security risk as someone else could use it to change your password. Don't Have a WordPress Hosting Account Yet? If you don't have a WordPress Hosting account yet, you are not taking advantage of the optimized servers. Now is the time to experience the fastest most reliable platform for your WordPress site. I am hoping someone can help me. Currenlty we have a website but the administration for the site has changed the password and possibly the username and that person has now left the club and as a result we cannot access or update the website we created. How do we overcome this?? If the processes above don't help, you can try doing so with WP-CLI in SSH. Alternatively, you can contact our live support for further assistance. I can't get into my Worpress blog anymore since I changed the URL address mistakenly because I was wanting to update the name of my blog. when I enter my blog name, it directs me to my internet servie (AT&T) rather than to my blog on Wordpress. The person who set up my account is also no longer avaialble for me to reach so I can't ask for them to help me at this time.. I don't know what to do to resolve this problem and I can no longer see or access my blog on Wordpress. Please help me. I'm sorry to see you're having trouble with your website. I recommend using a backup to restore the website to a state prior to when you made the changes. Otherwise, you have the options above to attempt to recover the website. I have an old Wordpress account from 2010. I posted a couple of semi-controversial blogs back then. Three total, I think. Anyway, I am starting a podcast using the same name as the blog. I would like to remove that content, but I have completely forgotten anything associated with the account. Username, password, email...I don't remember anything. What can I do?this is my blog: https://www. ************.com/blog/ it was made by WordPress. Since you do not have access the "Change WordPress password from dashboard" option will not work for you. I recommend using one of the other methods described above to reset your password and regain access to your WordPress. I added a plugin that shows my website being unavailable. I try accessing the site but for whatever reason I don't seem to remember the password. My issue now is that when I hit "Lost Your Password" it takes me to the splash page that says "THIS WEBSITE IS CURRENTLY UNAVAILABLE UNTIL FURTHER NOTICE". That error message shown seems to be a suspension notice. I would recommend contacting your hosting provider for further assistance with your account. I hope this helps! PS: My hosting is up to date. The "error message" I wrote on the splash page plugin. I would recommend following our guide on Troubleshooting WordPress Plugins. Disabling the plugin you installed to make your site display as unavailable should allow you to regain access to reset your WordPress password. I hope this helps! Excellent post! This is really helpful to used my business site development. Great work. I absolutely like this post. We're so glad to help! Thanks so much. you post really helped me getting control of my dashboard back. i really appreciate you guys..
That's so awesome! We're glad to see that we were able to assist you! I have an old Wordpress account from 2010. I posted a couple of semi-controversial blogs back then. Three total, I think. Anyway, I am starting a podcast using the same name as the blog. I would like to remove that content, but I have completely forgotten anything associated with the account. Username, password, email...I don't remember anything. What can I do? I'm sorry to see you're unable to recall those details. I understand that can limit your ability to work with your website. If you installed WordPress through Softaculous in cPanel, you can use the "Remove" option in Softaculous to uninstall WordPress. This will remove all the files as well as the database. If you installed WordPress manually, you'll need to delete the database. This link will help you determine the name of your database for the site (to ensure you don't remove the wrong one). Then you can delete the files associated with WordPress, using File Manager. This will allow you to install WordPress as a new installation (with no content related to your previous "controversial blogs"). Then, you can create a new username, password, and email address for the administrator and begin building the new website. The email could not be sent.Possible reason: your host may have disabled the mail() function. Reset your password following the section on using FTP. It worked. Thank you for this great help. Hi - I just got a password reset request email from Wordpress. I am not the only one on the account, so confirming the email is legit. The sender email is Wordpress@test. Is this the Wordpress email that a reset link would come from? Ann, that doesn't sound like a legitimate email. Still, we always recommend caution in these sorts of situations. Is the video above out of date? When I go to change the password through the dashboard I don't get the options above. Instead, I have to have a randomly generated password, which isn't helpful if you want to open the website on several devices. Do I have to now go through c-panel to change the password? Very annoying if so. Yes, the video is out of date since WordPress recently updated the interface. While it does autogenerate a password, you can easily change the one it auto-fills by clicking and deleting it. They are simply encouraging you to use a strong password for security purposes. Typically, you only need to change your WordPress password in cPanel if you are unable to access the Dashboard. when i type a password in that registers strong on the indicator it comes up that i must type in a password that is strong ? If none of the methods described above are working, I recommend following our WordPress Troubleshooting guide to further narrow down the cause of the problem. I had no idea why i got locked out of my WP admin but this post literally saved me!! I'm so glad you guys included the PHP part since I also was not getting the email when I request to reset my password. Thanks so much! Do you guys know how I can get my password reset emails to my desired email address, since that's clearly not setup for me right now? 3. You will then see the users listed with email addresses. Roll your mouse over the user and click Edit to change the email address associated with it. Hi, I have tried to reset my login using PhpAdmin, the emergency script, password email reset, and the FTP method. Still wont' let me in??? please help! confused. Sorry you're having problems with the login. If you're a customer of InMotion, then please give us the details on the site and account. We can take a look and see if we can help. You may be working with the wrong database if you're unable to use PHPAdmin to reset the password. Remember that you can use PhpMyadmin to look at (or alter) the email being used and then use the Lost Password option in the login to recover the password. Sorry for the problem with the password for your WordPress login. Check out this resource provided by the official WordPress Codex for Resetting your password. That should give you other options to recover the password. Remember that if you're using a security plugin, then you may need to consult with developers of that plugin on how to completely disable it in order to get into your site. Sorry for the problem with logging into WordPress. If you were given a website to manage, then you will need to speak with the person who gave the site to you in order to obtain the proper access. They can easily modify your user so that it is an Administrator, Editor, or Contributor, as per the role that is required. WordPress will not provide you information on login access as this is a security issue. So i have this problem. I changed wordpress password, but it only lets me to log in using it the first time i do it. Then it doesnt work and tells me that aither my password or user name is wrong. Why is this happening? Since this is unusual behavior, I recommend following our WordPress Troubleshooting guide to narrow down the cause. If your problems persist try renaming your .htaccess file. I've tried the emergency reset stage to trying to reset my WP password and it still doesn't work! I reeived the email but when going to retry it just keeps coming up with the authorisation login window. You should be able to reset the password directly in the database using PHPmyAdmin, or the FTP methods described above. The e-mail could not be sent.Possible reason: your host may have disabled the mail() function.. Sorry for the rpboem with resetting your password through mail. If you are unable to get mail, then you may need to contact your hosting service. As I can't tell who is hosting your site or the actual domain name for your site, it is difficult for us to troubelshoot the issue. If you're getting a bounce back message that appears when you try to send email, then you should definitely contact our live support team (contact at the bottom of the page). The emergency script is working but i dont know what is my admin username. How to find that? 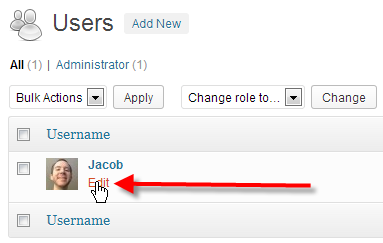 If you have access to the database then you look for the Admin user in the USERS table. I hope this helps to answer your question, please let us know if you require any further assistance. I tried emergency.php way but am getting a 404 error. Unfortunately, we cannot troubleshoot with the information you have provided. I'd suggest checking the filename and path to be sure its in the right place. Sorry for the problems with the script. Did you follow the directions to create the script and then place it in your website files? We need more information in order to determine why you're getting a 404. Please provide a step-by-step of what you have done so far so that we can try to duplicate the error. Saved the script below as a file called emergency.php to the root of my WordPress installation (the same directory that contains wp-config.php). Here is a link to our helpful article on 404 error not found pages. It provides additional information on this error. Next, I recommend following our WordPress Trobleshooting guide, as it may help you narrow down the cause. I'm also trying to log into my WP admin and tried the phpMyAdmin method but still can't get in. I also had a look at my logs and found an error log stating 'Parallels Panel' does NOT match server name!? '.When retrieving the lost password it says it doesn't recognise my email address. I'm not sure what to do next.Thanks. I'm sorry that you're having problems with the WP Admin login. "Parallels Panel" is not an interface that we use with InMotion (we use cPanel for our server interfaces). If you are unable to recover the database using the lost password feature of WordPress and you have tried to create a new user using this tutorial, but you're still unable to log in. Then you should contact your host's technical support to see if they can provide assistance with getting into the site. Thank you for contacting us. Try resetting your password via FTP, or using the reset script as described above. If your problems persist, I recommend following our WordPress Troublesshooting guide. I'm new to InMotionHosting and in process of setting up Wordpress blog. When I try to login to WP Dashboard, it doesn't recognize my password. Used to Forgot password function but didn't receive an email. Step 2, read your post on using PHPmyAdmin. There are two WP databases there (not sure if that's b/c I changed my original domain or b/c I loaded a theme + child theme. Not sure what to do now. Check in the wp_config.php file and you can find the database name. 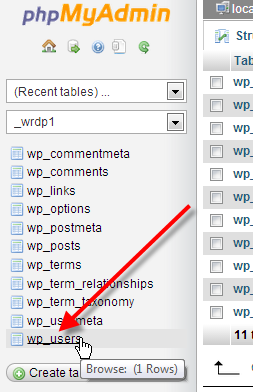 Once you know that, go into the database in phpmyadmin and look for the wp_users table. Open that table and you will see the user information. Remove and re-add the email information to an address you can access, then use the Forgot Password function at the login again. Has anyone seen this ? I went in to my phpadmin and chaged pw again but get the same message. Thank you in advance for any help. Thank you for contacting us. A 3rd party plugin, or Theme may be modifying the database. Our WordPress Troubleshooting Techniques guide should help you narrow down the cause. If your problems persist I recommend checking the server logs for additional clues. The FTP reset method is not working. ANy rips on this? I copied and pasted the code into line 2, uploaded it back to the server. But still no luck on logging in? As if nothing changed. Thank you for contacting us. Ensure your file permissions are allowing you to edit the files. Also review the file to make sure the changes you are making are being saved. If your problems persist, I recommend using a different method to reset your password. I'm an editor of someone else page.I have lost the password. How i can i get it back? There is a lost password link on the login page. It will send you a link to your email address. Hello, thanks for the artictle but in my case it doesn't work. For now I don't want use phpMyAdmin. I tryied chenge password by emergency.php. I got an e-mail with a new password but it dosen't work. Also I added line to funtction.php in my theme folder - no changes. Why it doesn't work? I'm not sure where exactly your reset is failing, but if it is at the login part then you may want to double-check your input to make sure you are putting in the reset pass correctly. sorry if I am asking a stupid question. I just installed wordpress on my raspberry pi 2. I can access my "site" by typing my ip adress on the browser. Unfortunatelly, I can not get access as an admin even though I am typing the correct username and password. Also I can't have an email sent to me. Now I really have to reset the pssword. Can you provide an analytic solution for my system (Raspbian or maybe Linux)? Are you getting any particular error? Also , what URL are you using? We can really only help with hosted solutions as that is what we primarily deal with. If you can give us a little more information (version of linux, you're using, error messages, URL), then we might be able to help. You may need to address the WordPress support forums directly if we cannot provide assistance. It says that the password is incorrect. That is why I am trying to reset the password. The URL I am using to access the site is my ip adress. I am using a Raspberry Pi 2 so my OS is Raspbian, a version of Debian. If you can tell me any terminal commands I can type or any other solution I would be obliged. Sorry for the continuing problems with WordPress. You try to use the password recovery option if you have access to the email used when you did the install. If not, it might be quicker for you to simply delete the installation and start over. Just make sure you have access to the email that you specify during the installation so that you can recover your password if you are having problems. Make sure that you have the required database and the requirements needed for WordPress to correctly run. Here's the running WordPress on a Raspberry pi. Thank you so much for the answer. How do I delete the instalation? Do I delete some files in var/www/html? At least in our installation, WordPress creates a folder in the default root for the website - which I assume is different on your Raspberry Pi. Just delete that folder and the database and you can then re-install it. i trid to reset my password via phpMyAdmin and its working.thanks for you tutorial. I am trying to change password from phpmyadmin panel and also tried to login but still no luck. Will you please give me any solution ? When you are changing the password field, please be sure that you are using your password after it has been converted to a MD5 hash. You can use a MD5 generator and update the field. Mr Edens, you seem to have some good knowledge of these password problems.. Our church has a site set up for one of our foundations and the ones who did it have migrated to other areas of the country and cannot remember all they did to set it up and the user name and password..only guess's at this point. I need to take over and get into the site which I have tried with the info they gave me without success. Can we do a restart "Sort of" and keep the info and reset the password and confirm the user namee etc. Thank you for contacting us. Yes, you can reset your WordPress password from PHPmyAdmin, as described above. I woke up today and could not access my WP admin backend, then om my site's frontpage, I saw CYBERLORD was here! I knew instatntly that I've been hacked. I stumbled on this post and I was able to reset my password via PHPMyAdmin. Thanks a lot InMotion Hosting. You guys rock!!!! I am glad that you found this article helpful but not that you got hacked. I would suggest the following article to help prevent a hack in the future. Thank you for contacting us. I recommend checking the database name for WordPress. This will allow you to confirm you are resetting the admin password in the correct database. Next, check your DNS, to ensure you are pointed to the correct server. We can help you troubleshoot this further, but will need to know the domain name. Yes I tried, they say there is no email or username with my information ?? If you follow the steps in the guide (not necessarily the video) it should work as I just did the same actions on a wordpress website I have installed. I'm doing exactly as the video, but it doesnt work. Have you not had success in having WordPress send you a password reset email? Fantastic help. Used the PHP thingy and changed the email address to rest my password. Awesome thanks. WordPress is telling me my e-mail address is not in their database and so cannot reset my password. I currently have no access to the admin area of my website. HELP! You can use the section above regarding using phpMyAdmin. Once in the wp_users table, you can then simply change your email address in the database and then use the normal method of having sending an email for password change. Thank you for contacting us. We are happy to help, but I am not sure what you are asking for. Could you provide more information, so we can further assist you?